We install a wide range of engine system - Inboards, Outboards, Jetdrives, Electric engines, Gasoline Engines, 4kW up to 460PS V8. Welcome to the world of Mercury Marine®, where we constantly thrive for the boats lovers, innovations, intuitive products, endless possibilities and a global, high qualified support team, that enables the best possible experience. Conquer new horizons with an engine, that you can rely on, just as much as on the people who built it. The most modern technology on land or sea. Honda offers the biggest range of 4-phase-outborders in the world. From the light and handy BF 2.3, to the powerful High-Tech-Engine BF225. More than 40 years of experience in development and production of 4-phase-outborders make Honda a pioneer on this area and essential in the development of marine Outborders. Numerous tests and national, as well as international press are agree - the most advanced Outborders in the world originate in Starnberg. 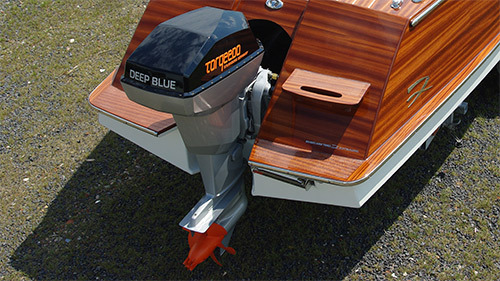 Just like our customers wordwide, that can not think about their boat without an electric Outborder from torqeedo. Aquawatt builds the most powerful High-performance-electric outborders worldwide for commercial vehicles and sport boats.